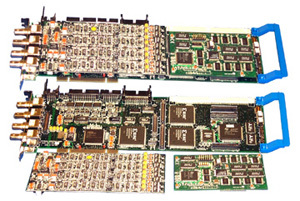 The PCI/DSP-4 board is the heart of the DiSP System. Due to advances in surface mount technology and high density ASIC devices, we have been able to provide this single PCI card with 4 complete high-speed, channels of Digital Signal Processing (DSP) based AE data acquisition, up to 8 parametric input channels (on the first card) and optional waveform module. Through the high performance PCI bus, significant AE data transfer speeds (up to 132 Megabytes/second) can be attained. This assures a wide bandwidth bus for multi-channel AE data acquisition and waveform processing. Since the 32-bit PCI bus has become the de-facto standard in all PC computers today, PCI/DSP-4 boards can be implemented inside your PC or inside one of PACs rugged, multichannel DiSP workstations. Make a Customized AE System: Utilize PCI/DSP-4 Subsystems and your own PCs to build customized AE Systems. PAC provides you with Windows DLLs, LabView drivers, etc. Please contact us for more details. Each DiSP Workstation houses an entire acoustic emission (AE) system including a standard, powerful, integral PC computer (and peripherals such as CDROM, hard and floppy disks) and up to 56 AE channels, using our PCI/DSP-4 boards. Several different chassis are available, including sizes for 8, 16, 24 and 56 channels. The DiSP-16BT AE Controller is based on a high-performance PC, designed for both laboratory and light industrial use and houses four (4) 4-Channel AE subsystem PCI cards (PCI/DSP-4) for a total of 16 channels of simultaneous feature/waveform based AE. 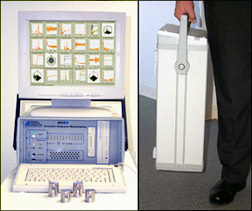 The DiSP-16 is based on a heavy- duty desktop PC computer chassis with added features for reliable day-to-day operation, including extra cooling and ventilation, and incorporating the latest powerful PC computer motherboard. The PC Main AE Controller gives the user the lowest cost for a high-performance AE system. The system is certified by PAC to run AEwin, PACs latest Windows software, and includes 16 Hit LED on the front panel and an on-board Ethernet 10/100 Mbit interface. An optional, digitally controlled, high fidelity audio monitor is available. The system is 17" (43 cm) W, 17" (43 cm) D and 6" (15.2 cm) H and weighs 26 lbs. (with 16 channels) and comes complete with external Video 17" CRT monitor, keyboard and mouse. The optional "PAC AE System Viewer" software provides the ability for remote control over the company network. Similarly, the DiSP-24 is a portable, hardened and compact AE system, equipped with a handle for carrying and an integral keyboard built within the hinged front protective cover. Weighing less than 38 lbs. (17.3 kg) with all 24 channels, the DiSP-24 is 21" (533 mm) L x 14" (356 mm) W x 7.6" (193 mm) H. Inside this small enclosure is a powerful PC computer, large hard disk, floppy drive, CD-RW drive, and the standard complement of parallel printer port, serial port, USB and mouse port. Built-in AE features include a digitally controlled high fidelity AE audio monitor, 8 parametrics and AE Hit indicator LEDs. System communications capabilities include built-in Ethernet 10/100 LAN and optional AE system expansion interface for connecting multiple DiSP Systems to one AE test. The optional "PAC AE System Viewer" software provides the ability for remote control over the company network. The DiSP-56 AE Workstation, houses an entire acoustic emission system including up to 56-Channels (14 PCI/DSP-4 AE Subsystem boards) of simultaneous feature/waveform based AE channels, 56 Hit LEDs on the front panel, fully integrated and digitally controlled, high fidelity, AE audio monitor, powerful, integral PCI-bus based computer and all standard PC computer peripherals (such as floppy, hard disk, CD-RW drive, serial and parallel interface ports). The DiSP-56 is a heavy duty, industrial, desktop (or rack mountable) chassis with high capacity cooling and ventilation for reliable day-to-day operation. The system is 17.5" (445 mm) Wide, 10.5" (267 mm) High and 19.0" (483 mm) Deep and weighs 58 lbs. (26.5 Kg) with 56 channels. The DiSP-56 comes complete with external Video CRT monitor, keyboard and mouse. System communications capabilities include; built-in Ethernet 10/100 LAN, and optional AE system expansion interface for connecting multiple DiSPs to one AE test. The optional "PAC AE System Viewer" software provides the ability for remote control over the company network.